Randolph College offers a monthly payment plan for families who wish to make monthly payments on a tuition bill. No interest is charged in this program that enables families to spread tuition payments over 10, 9, 8 or 7 months. A $55 annual administrative fee is charged. Families determine the amount they want to finance under this payment plan each year. To take full advantage of the 10-month payment option, enrollment must be completed prior to June 1st each year. Enroll here using the login information described below. Your login to enroll in the monthly payment plan will require your “people code ID#.” This is a nine-digit number (minus dashes) located in the upper right corner of the billing statement (expressed as P000-99-9999). Your PIN is simply the last six digits of the people code ID#. [For example, if your student ID# is P000-45-4545, the login ID# will be 000454545 and the PIN will be 454545.] Your student ID number is also located on your Student Portal account. The Randolph College Plitt Loan is a college loan program that helps families bridge the gap between the Cost of Attendance and the student’s financial aid award. The maximum amount available each year through this loan program is $10,000. The interest rate is 3.5% with a loan repayment term of 96 months. Repayment begins about 30 days after the loan is disbursed to the student’s account. Both the student borrower and the cosigner will undergo a credit check for this loan. Application will be available after May 1. To apply for a Plitt Loan, please email financialaid@randolphcollege.edu or call us at 434-947-8128. Alternative loans are loans in a student’s name for which they will need a qualified cosigner. Randolph College works with a number of lenders who are committed to the student education loan industry. However, if a student chooses to borrow from another lender, Randolph College will certainly accommodate their choice. Interest rates can be fixed or variable, and loan repayment options can vary. Students may borrow up to the Cost of Attendance minus all other financial aid awarded. Alternative (or private) loans are offered by private lending institutions and are not guaranteed by the federal government. These funds can be available to students who may not be eligible for federal loans or who may need additional funding to cover the total cost of attendance. Exhaust your federal loan opportunities first. Federal loan program provisions may be more favorable than those of private loans. For convenience, we offer the FASTChoice alternative loan tool. Don’t see the lender you were looking for? Contact the Financial Aid Office. Several lenders also offer private loans for parent borrowers as an alternative to the federal Direct Parent PLUS Loan. For information about private parent loans please click this link: private parent loans. Ready to learn more, compare loan options and apply? Go to FASTChoice. 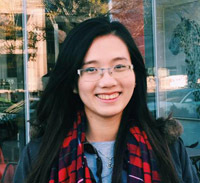 Ha Tong '15, Operations Analyst, Goldman Sachs "My summer marketing internship at Energizer Holdings, Inc in Shanghai, China gave me valuable professional experience and opened doors for future career positions."